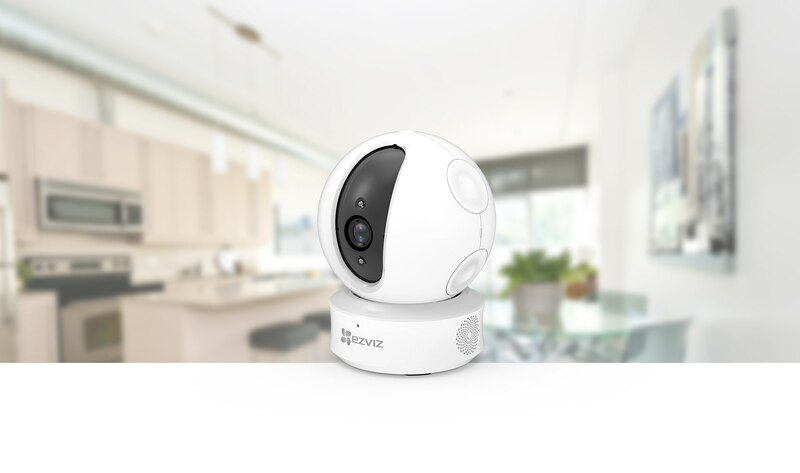 Designed as a pan-tilt Wi-Fi camera with panoramic viewing angles, the C6C (ez360) delivers a 360° horizontal field of view with smart tracking.Integrates with the EZVIZ alarm sensors to give your family 360° security. The C6C (ez360) offers expansive field-of-view coverage with 340° horizontal, 105° vertical upward and 15° vertical downward rotations. The C6C (ez360) keeps a lookout for you. 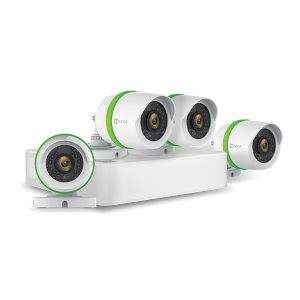 Upon detection of movement, the C6C (ez360) automatically captures and tracks the motion while delivering notifications and video recordings in real time. The thoughtfully-designed privacy shutter allows you to turn the lens off whenever you need privacy. Up to 1080p resolution and 2-million pixel HD quality. 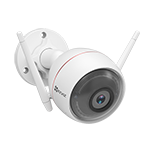 The C6C (ez360) uses two powerful infrared lights for night vision up to 10 meters (depending on environment). Switches between day and night modes automatically. When you are away from home and want to speak to loved ones or pets, there's two-way talk. Just press the button on the EZVIZ app and theC6C (ez360) will help you do the rest. The C6C (ez360) comes with screw-in base mounts and supports image flipping, allowing for table or ceiling installation depending on your needs. 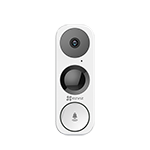 The C6C (ez360) can be integrated with EZVIZ alarm sensors via the app. Once an alarm is triggered, the camera will immediately capture a picture and video footage and send them to the device owner. 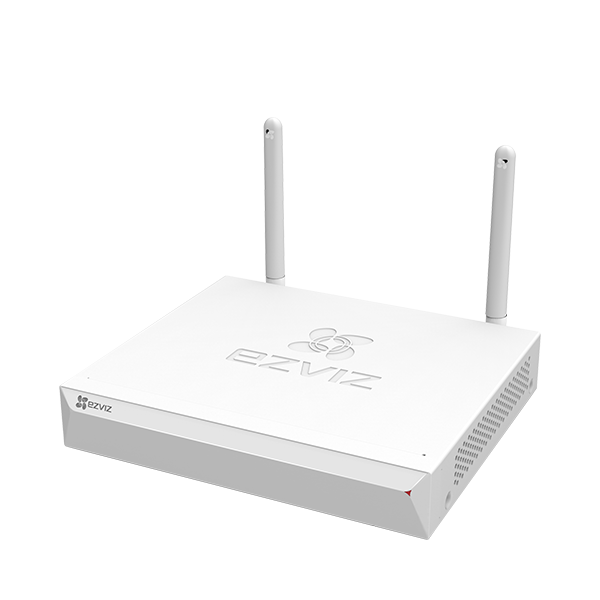 ez360 1080p is rated 4.8 out of 5 by 83. 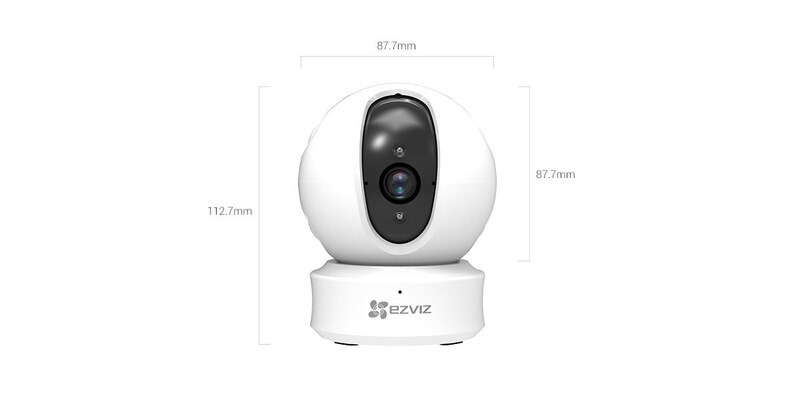 Rated 5 out of 5 by Neezi7 from Ezviz security camera Really easy to install. You can down an app on your phone called "ezviz". You sign up and take a picture of your security camera qr code that is located on the bottom of the camera. Then set it up with your wifi. The security camera includes high definition pictures, it could move 360 degrees, also go and down. Now if you want put the camera on privacy mode you could by putting clicking on the eye icon which in other word sleep mode. You can talk through on the phone app and you can hear it through the camera. You could also hear what the other side in the camera speak or make noise. 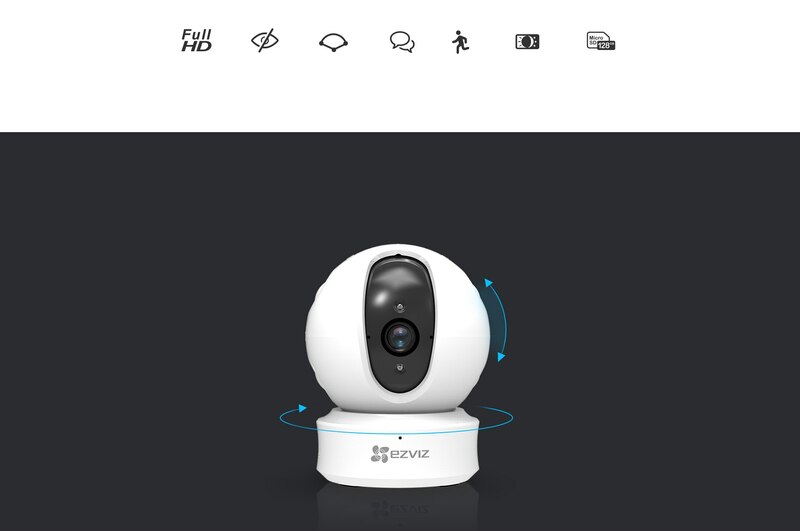 It's a great smart security camera. Rated 4 out of 5 by Brendaj from Good cam I tried this camera out for a few days now and I gotta say I like it! I love the way I can move it remotely and it captures all that it sees. Only draw back is the subscription to store data, and when I am away and to move it loses connection as if it was weak. The connection works flawlessly when I am at home but it suffers when you are remotely using it. I couldn't find the SD card slot even by looking at the instructions Felt like I would break it based on the picture in the instruction manual if I followed where it was located. The high definition looks great, the sound is great. All in all I would still buy another for my upstairs hallway. Rated 5 out of 5 by Luckypenelope from High quality indoor camera I have been using this camera for about a month now and love how clear the picture is, the app controls and remote access. It even has night vision. My boyfriend can log in to our account when he is traveling and check on the house. I like that I can check in on my teenagers when I am away from home. The app is simple to set up and gives you the option to pan and tilt, take pictures and record videos. I keep this camera rolling 24 hrs which gives me a sense of peace that my home is protected. I plan on getting a few more for other areas of my home. 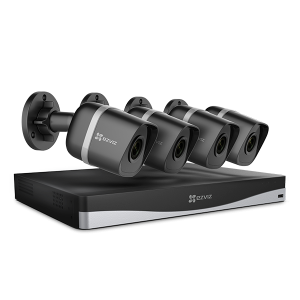 Rated 5 out of 5 by MyShpngDiary from Great clarity and motion tracking is great too I have been using a HD wifi camera and have been happy with it until I received the Ez360. The video quality is much better on the Ez360 and the motion tracking mode is great. The camera moves automatically tracking a moving object/person.The sleep mode actually moves the camera module upwards such that it is covered. This definitely gives you the peace of mind knowing that your privacy is maintained. Just one con compared to my existing camera. I didnt find a web interface where I can see the live feed. In cases where I dont want to use my mobile data, but still want to view the feed on my laptop using the wifi(say at work? ),I do not have an option. Rated 5 out of 5 by Jaa0810 from Great! The first time I used this was when we went on vacation. I had it sitting on the counter pointing towards both of my entrance doors. I loved it because I had 2 cats at home and it was in view of their cat food bowls. So whenever they are running out of food, I asked my friend to come over and feed them/give them water. This way she wouldn’t have to come over everyday to check in them. You can put a card in so it will record. The camera moves up down and all around. You can also take pictures of anything that is in view you can do all this from the app on your phone! Loved it and will probably buy another one to put in another room! Rated 5 out of 5 by Ilm2k4ever from Great camer with Great features. I have been using this camera for a few days now. Right out of the box it was breeze to setup. The app is simple to use and easy to understand. The camera connects to your WiFi right through app. Putting it into privacy mode is super simple by just pressing the “eye” icon in the app. The 2 way audio is loud, crisp and clear from both the camera and through the app. The video and still shots are SUPER clear. Not grainy at all! I LOVE that as soon as lotion is detected o get a notification sent to my phone. I can also take snapshots of video. Easy way to get the Face of an intruder on a still shot. This camera is AWESOME!!! Rated 5 out of 5 by Miamimom from Great monitor! I waited a little while before writing a review because I wanted to be sure I had enough time to get comfortable with it. Setup was a breeze, the app is easy to use and the picture is surprisingly good quality. It is easy to move the camera through the app and the motion detector works well. I was a little concerned because my WiFi router is upstairs on the opposite side of the house but the connection is strong. I like that the sound is two-way, so I can soothe my baby as I’m walking to him. Overall, I’m very pleased with this monitor and really can’t think of anything negative to say about it. How do I get the IP address that was assigned to the cam? How do I operate my Security camera after registering my camera? I need to see the viewing of the surroundings. Is there a cost for the app? or ongoing subscription fee? No cost for the app and free subscription. How does it get power, does it plug into the wall outlet. Can this be power with PoE?